Following the success of the Beocenter 2500, the Beosound Century answered the need for a cheaper, more basic version. Equipped with a pair of Beolab 2500 loudspeakers, this was undoubtedly a quality system, but it was also bulky, heavy and expensive. This was in part due to the fact that the integration of the components was limited, and so, for example, each unit had its own separate power supply section, adding weight and cost. 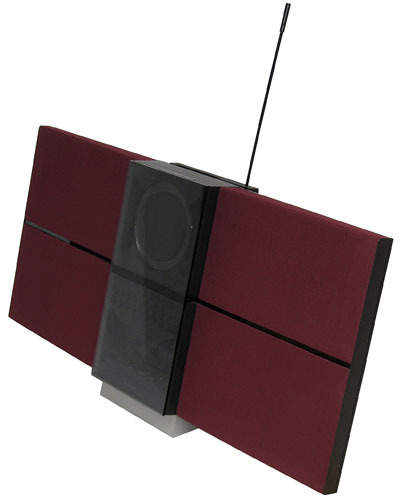 The Beosound Century however, was made in one piece, allowing considerable savings to be made. This also meant that the cabinet could be made very slim (ideal for wall mounting), and light enough so that with an optional carrying handle (which also housed an active FM antenna) it could easily be moved from room to room. Text copyright © Beocentral. Unauthorised reproduction prohibited. To re-enforce the links with the very popular and desirable Beocenter 2500, a glass sliding door was fitted, that responded to the approach of a hand in a similar way. To avoid cost and complexity, only a single door was fitted, and its mechanism was integrated with the one which operated the CD cover. To emphasise the compactness of the unit, most of the frontal aspect was covered with the loudspeaker grilles, which also suggested large, powerful loudspeakers. In actual fact, the loudspeakers were of moderate size, and much of the electronics and the mechanism for the door was located behind the grilles. The grilles themselves were made available in a choice of colours. Text copyright © Beocentral. Unauthorised reproduction prohibited. There was no doubting though that the original versions of the Beosound Century were very, very basic. For example, the radio section covered FM only, there was no headphone socket and although a 7 pin “audio aux” socket was fitted, this was wired as an input only, without Data Link. Also, even though an infra-red sensor was fitted, if the owner wanted remote control they would have to buy a Beolink 1000 separately as it was not included in the price. The first two issues would be addressed in later models. The power amplifier, described as “Class G”, followed the practice of the other B&O “active” loudspeakers, in as much as there was an electronic crossover followed by separate power stages for treble and bass. Electronic protection for the drive units was fitted, which in the case of the bass section worked in a similar way to the “electronic fuse” used in the Beomaster 1200. The power output of the amplifiers was not stated, but is estimated to be in the order of 15 watts per channel. Text copyright © Beocentral. Unauthorised reproduction prohibited. Whilst the radio and CD player were conventional and followed Beocenter 2500 practice, the cassette section had a few unusual points. The deck itself was not like any other used by B&O and was made by Philips. Apart from the head, the two motors and a few other small parts there was a remarkable absence of metal in its construction. Also strange was that metal particle tapes (such as TDK MA) could not be used, the machine was set up for ferric and chrome tape only. Text copyright © Beocentral. Unauthorised reproduction prohibited. Most odd though were the noise reduction (NR) arrangements. At no point did B&O state that the cassette section offered Dolby noise reduction, preferring instead to simply refer to the system as “NR”. This was strange as the chip used to perform the function (made by Sony, not a usual component supplier to B&O) was in fact a Dolby B processor, recognised by the Dolby company. It is the case then that officially the Beosound Century does not have Dolby noise reduction, but in actual fact does! One last oddity in the cassette section was that the rest of the signal circuit was designed around a chip intended for double cassette decks, with half being left unused. Text copyright © Beocentral. Unauthorised reproduction prohibited. Various accessories were available for the Beosound Century. Mention has already been made of the handle/active antenna and the remote control terminal, but one could also buy a wall bracket or a table stand, one or other of which would have been needed as the set could not stand up on its own. Text copyright © Beocentral. Unauthorised reproduction prohibited. Despite seeming basic in comparison to some of the more established products, the Beosound Century proved popular for those wanting a little taste of B&O without too much cost and complexity. Text copyright © Beocentral. Unauthorised reproduction prohibited.